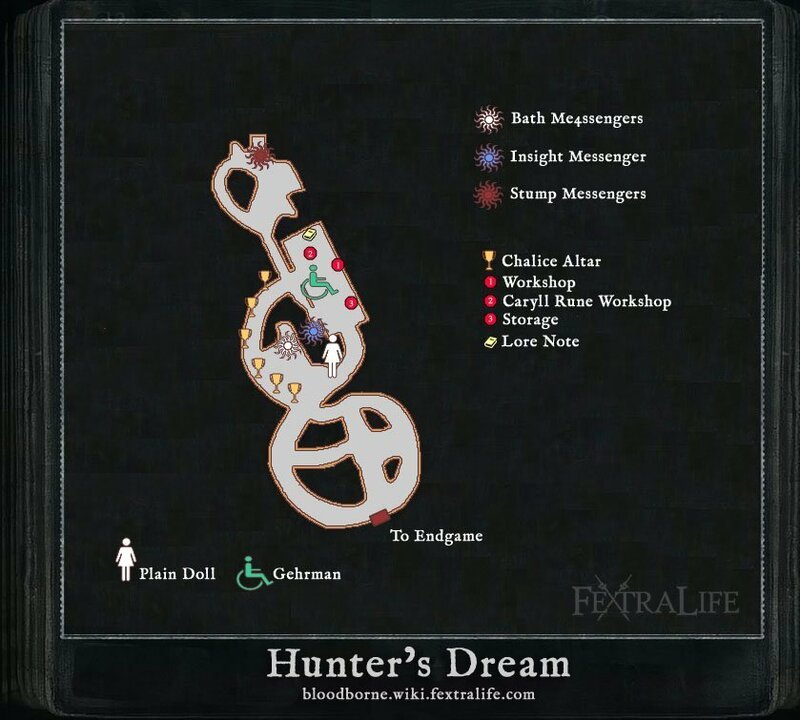 Hunter's Dream is a location in Bloodborne. Also known as Dream Refuge, it is the place where the player goes after their first death and operates as a central hub, providing trade and upgrade services. The player can port from this location to any of the Lamps that they have activated. In a corner, next to the altar at the farthest end of the house, is a page, with information on the main goal of the Hunters during the night of the hunt: "To escape this dreadful Hunter's Dream, halt the source of the spreading scourge of beasts, lest the night carry on forever." There are more than 360 headstones in the Hunter's Dream. The Hunter's Dream originated from the Abandoned Old Workshop. From the start, move forward to find an inanimate doll. On the left of it, find the Bath Messenger - basically a merchant- and a flight of stairs on the right. Up the stairs, interact with the first Messenger sign ahead to find your first tutorial tip: "The Messengers offer you a Trick Weapon. Choose one. Trick Weapons are wielded with the right hand, and employed in beast hunting." Continue up the stairs to the second Messenger for the second tip to pop up: "The Messengers offer you a firearm. Choose one. Firearms are wielded with the left hand, and employed in beast hunting." Atop the stairs, find a Notebook. Once you're done, head back down and use Yharnam Headstone to return, and make your way to Central Yharnam. After you enter Central Yharnam and light the Lamp there the house will open on your next visit. If you ignore the Wolf Beast in the clinic and instead run straight to the lamp without dying, the house will also be open on the first visit. Inside you'll find Gehrman, the Workshop, your item Storage and the Memory Altar. After you have entered your first Boss arena, or gained 1 Insight, the Plain Doll will be alive upon your next visit. You can then talk to her to level up your stats. On the staircase the Messengers will now offer you your first multiplayer items: the Beckoning Bell and the Silencing Blank. After you have gained 1 Insight, a second set of Bath Messengers will unlock, allowing you to trade Insight for items. If you fall below 1 Insight, the merchant will become unavailable again after you close the dialogue window. Once the blood moon rises or having 50 Insight, the music in the Dream will change to another soundtrack, Moonlit Melody, focusing on the voice more than the instruments. After defeating Mergo's Wet Nurse, the Hunter's Dream will change as morning is almost here. If you talk to Gehrman after the fire starts, you are at the point of no return. See New Game Plus page for information. At seemingly random points during the story logging into the game while stationed in the Hunter's Dream will cause random voices or conversations to be heard by the Hunter. does anyone know why the hunters workshop doors are locked? So according to lore, the dream was conceived by a Great One who sympathized with gerhman&apos;s pleas to escape his loneliness. But how exactly did hunters of the Dream come to be? At the beginning, our character obtains &apos;a bit of yharnam blood&apos;, and is whisked away. Is that it? I had this crazy though. In hunter&apos;s dream you can see your house and it&apos;s very limited, just a small place, then this came to my head, what if, those pillars in the horizon are others hunter&apos;s dreams? And you&apos;re in your pillar. Has anyone noticed the red mist directly above the workshop in the Hunter&apos;s Dream? Anyone know what it is? So, I left my hunter in the Beg for Life pose in front of the doll for maybe 20 minutes while I was eating dinner.I&apos;m now currently hearing footsteps walking around in somewhere but the doll is obviously standing in front of me, my character isn&apos;t moving and at this point in the game, Gerhman is gone.Does anyone else hear footsteps? Can I still use the workshop after beating Mergo&apos;s Wet Nurse and before Gehrman? I wonder if the spires have any significance in the lore. I&apos;m beginning to think they are "abandoned"; left behind from hunters who no longer dream. My reason is mostly from Djura&apos;s and Eileen&apos;s dialogue. Gehrman also seems to mention something about this: "This will be your home, for now" That&apos;s my interpretation at least; I have not completed the game yet. I could be way off. The link to the book "How to pick up fair maidens" sends me to the Rosmarinus page which is completely unrelated. Also I don&apos;t think it should be under lore notes since it is an Easter egg. Does anyone know what kind of flowers they are? I thought they were lilies or daisies but neither of them are a match, either not the right kind of leaves, not the right amount of petals, or both. Im on ng +1, doing the dlc missions, ive lost most of my progress has.to get everything back and going, went to the nightmare frontier and now i cant leave it. It turns out you can see your headstone in NG+ if you get the Yharnam Sunrise ending. I found out when I found the doll there (after mild panic of not seeing her). Just thought it was a cool extra detail in the game.